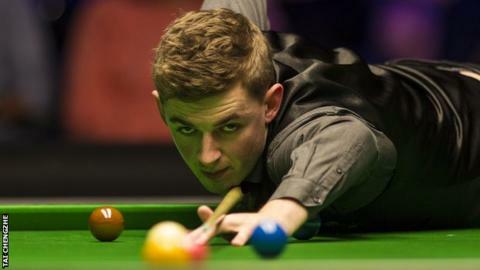 James Cahill became the first ever amateur to reach the Crucible as Ali Carter and 2006 champion Graeme Dott breezed through final qualifying to also book World Championship spots. Cahill, 23, beat Irishman Michael Judge 10-6 after both amateurs had defeated professionals to reach this stage. Dott brushed aside Norway's Kurt Maflin 10-2, while twice runner-up Carter beat fellow Englishman John Astley 10-4. Scotland's Anthony McGill won seven straight frames to beat Robert Milkins. McGill came from 7-2 down to win 10-8 and also book his place in the 32-man draw. Blackpool potter Cahill - relegated from the tour in 2017 - will regain professional status after his qualifying exploits. He will be one of seven debutants at this year's tournament. Michael Georgiou will become the first Cypriot to play at the Crucible after beating Yan Bingtao 10-8, while Scotland's Scott Donaldson secured his debut with a dramatic 10-9 win over Lu Ning. Chinese quartet Zhao Xintong, Li Hang, 19-year-old Luo Honghao and Tian Pengfei - who survived a fightback from another twice Crucible runner-up Matthew Stevens - also secured Sheffield debuts. Along with the seeded Ding Junhui and earlier qualifier Zhou Yuelong, that foursome will ensure a record six Chinese players at this year's tournament, beating the previous mark of five in 2017. The draw for the first round of the World Championship - which runs from April 20-May 6 - will be made on Thursday at 11:00 BST at the Crucible Theatre.